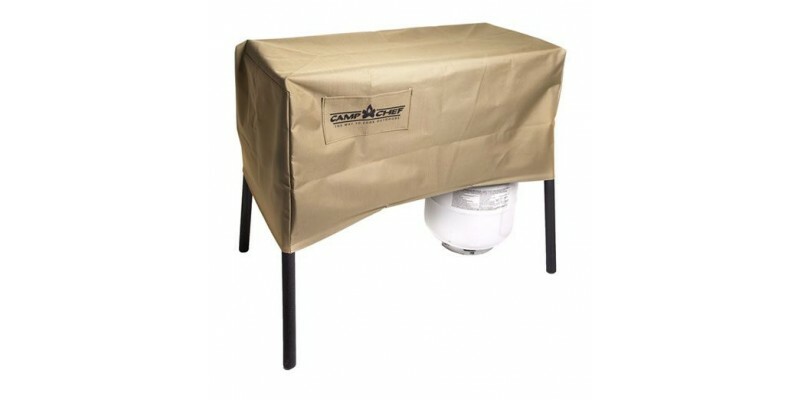 Protect your two-burner stove with this durable, weather-resistant patio cover. The khaki color blends in with any color scheme in the backyard or at base camp. This Camp Chef patio cover is made with weather resistant material, so your two-burner stove will stay dry during a spring rain storm and shaded on a blistering summer afternoon. Not even the wind can stand up to this cover: a set of bungee cords and hooks ensures a secure fit. The neutral khaki color will match any of your patio décor or fit right in at base camp. Your stove takes great care of you—it’s time to return the favor. 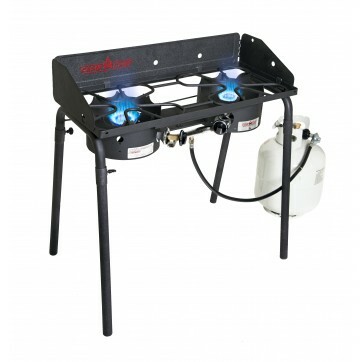 Camp Chef 2-Burner Stove Cover is rated 4.5 out of 5 by 14. 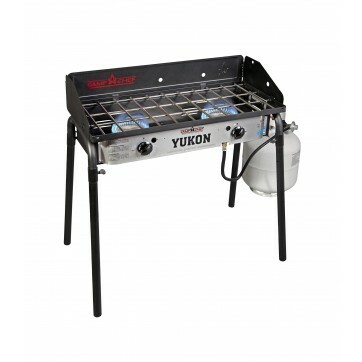 Rated 3 out of 5 by Rick from Good but has weak spots The cover is heavy duty fabric and covers the stove well. The front pocket is kind of dumb since the cover is meant to protect the stove from the elements... such as rain and air-borne crud (leaves, seed pods, etc.) The rain does drain out over time. The stretchy straps on the bottom that are meant to keep the cover from being lifted off by the wind are a good idea. Too bad one pulled off the second time I went to use it and the other a while later. Disappointing. Rated 4 out of 5 by Stan in NC from This is my 2nd cover My first cover was exposed to the hot southern sun in North Carolina for about three seasons. The inside liner component started to disintegrate resulting in water leaks. I did order a new one. The new one fits well, looks fine, and time will tell how long this one lasts. Rated 5 out of 5 by Anonymous from a perfect fit This cover is very well made from strong material. It keeps the stove protected from the eliment. Love the wrap wire lock that came with the cover. It keeps the cover in place and from blown away by high wind and we do have a lot of high wind in Texas. Rated 5 out of 5 by neckylooksha from love it Quality item; love the color. Now I can leave my explorer stove outside without worrying about it. I used to put it in the garage when not in use for fear of rust and wear. The cover is waterproof and so far has sustained windy conditions. Rated 5 out of 5 by Ultra Classic from Absolutely awesome I love the high heat. As someone used to a commercial stove this is perfect. I have a BBQ pit and added the stove. Wind doesn't bather it and the sturdy construction is awesome. Rated 5 out of 5 by Edward from Love This Cover This cover is a perfect fit for the outdoor grill. No more having to take apart after each use and put in the garage. It fits perfectly, is sturdy, and is secure. Rated 4 out of 5 by Bob from nice cover but could wider The stove cover could be made a few inches wider to fit over a stove with side shelf brackets mounted on. I had to remove mine to put the cover on.